Our volunteer network is made up of hundreds of highly-skilled attorneys, doctors, psychologists, and other professionals who donate their time and expertise to help us further our mission. American Gateways conducts screenings for services on a walk-in basis. Screenings are done at the Austin office from 9:00 AM to 12:00 PM, Monday through Thursday. Screenings are conducted at the San Antonio office from 9:00 AM to 2:00 PM, Monday through Thursday. No appointment is necessary at either location. We are now offering services in Waco, TX by appointment only. The Rodriguez Family (names changed for the sake of anonymity) came to American Gateways after surviving a serious crime that severely impacted their whole family. With the help of American Gateways, they filed an application for U nonimmigrant status (the U visa). After several years of nervous waiting, their applications were finally approved in October of 2015. The U Visa allowed the Rodriguez family to live and work legally in the United States, which greatly improved their quality of life. Before, they lived in constant fear of deportation. Now, they were able to find better jobs and buy a home. The Rodriguez’s felt their lives took a 180 degree turn for the better. They are grateful for the help American Gateways offered to them and they continue to be involved with the organization. “My family and I came to the US fleeing the civil war in El Salvador. I was very young when we came to the US. My family was seeking asylum and American Gateways helped us to achieve that. We first sought help from American Gateways when it was called PAPA in the late 1990s. They were able to help my family through the asylum process and we eventually were all able to get our legal permanent residency. Cindy is a citizen of the Democratic Republic of Congo (DRC) and was born in the lakeside city of Bukavu in the country’s eastern region. When Cindy was eight years old, she joined an organization that advocates for the rights of children. When she was twelve, she became the spokesperson for the local chapter and won an award for a film she made about child sexual abuse. Cindy first began to sense that her involvement in the party might put her life in danger in 2006. After a party meeting, her uncle, who was the president of the local chapter at that time, dropped her at her house and then headed home. He never made it. Cindy’s family only heard from him again in 2010, when he called from a jail in Kinshasa to say that he had been abducted by masked men and taken to jail. In around February of 2007, not long after the president of the nearby chapter was killed, Cindy received a note at her home addressed to “C.” The note read “It could be you. Be careful.” The same day, Cindy received a text message from the spokesperson of another chapter saying that they had received the same threat. The following month, Cindy’s mother sent her away to boarding school, believing that she would be safer there. In 2012, Cindy moved to the city of Goma, where she lived with a cousin and began studying law at the local university. She remained active in her party, attending meetings and engaging in outreach work with homeless children. She also met with local government officials to discuss the rights of children and sent communications to the national government denouncing the use of child soldiers. In November 2012, war came to Goma and a rebel group took the city. Not long after, Cindy found a note at her home listing the names of the local leadership of the party, including her own. She interpreted this note as a threat. In April 2013, a group of armed men came to Cindy’s home. Cindy recognized them as rebels by their uniforms. Cindy’s cousin told her to hide in an upstairs bedroom and went downstairs to confront the men, who had entered the compound. Cindy heard sounds of a struggle and then saw all the men running from the home through the upstairs window. When she went downstairs, she found her cousin had been beaten to death. Following this incident, Cindy decided that it was no longer safe for her to remain in the country. She stayed with a neighbor while she began making arrangements to come to school in the U.S.
Cindy arrived in the United States with a student visa in August 2013. Because she could no longer afford to attend classes and had to withdraw from the University of Texas, her status expired. However, thanks to the help of American Gateways and her pro bono attorney she was granted asylum in 2014. Cindy is now back at school and applying for permanent residence in the U.S.
An attorney by training, Berhane became politically active during law school. Concerned about the level of ethnic and political violence in his home country of Ethiopia, he decided to dedicate his career to conflict resolution. After he graduated, he worked for a number of non-governmental and international organizations on peacebuilding and advocacy projects. Unfortunately, Berhane’s activism drew the ire of the Ethiopian government. He received a number of threats and was twice beaten and once jailed by Ethiopian security forces. He decided to leave the country for good after a friend warned him that he was about to be arrested for a second time and prosecuted as a terrorist. Berhane arrived in the U.S. in October 2014. With the help of a pro bono attorney and American Gateway staff, he applied for asylum in early 2015. Married and expecting his first child, he is eagerly awaiting a decision in his case. Lucy was born in San Pedro Sula, Honduras. In February of 2008, gangsters entered her home and murdered her brother in front of the entire family, shooting him 20 times without saying a word. From that moment on, Lucy and her parents lived in constant fear of being targeted and killed by the gangs. By August 2014, the gang violence in San Pedro Sula had reached unendurable levels. Lucy hoped to join relatives living legally in the U.S. During her journey, she and several other immigrants were kidnapped by a criminal group and taken to a house in Reynosa, Mexico. Lucy was imprisoned in the house for 2 months. In November 2014, Lucy’s captors crossed her into the U.S. and forced to her to walk until she reached Roma, TX, where a vehicle picked her up and took her to an abandoned mobile home full of other immigrants. Later that day, she was moved to the parking lot of a Wal-Mart in McAllen, Texas and, eventually, to the home of a woman named Inez who lived nearby. Lucy had effectively been sold to Inez. For 6 months, Inez would wake Lucy up by screaming at her at 4:00 or 5:00 each morning. She was forced to care for the Inez and her young daughter without having any of her own basic necessities met. Seven days a week, she cleaned Inez’s entire house and did all of the household laundry. She slept on the floor of a very small space in the back of the house and was fed one egg and water every day. She was only allowed to bathe once a week and was not given any blankets or warm clothing. Lucy became very ill, but was never offered medical care. She dared not escape as Inez had installed an alarm on the house’s only door and threatened to call the police or Border Patrol if she tried to leave. Lucy finally escaped the house in March 2015 when Inez and her daughter were distracted. She stopped at a nearby store where a man offered to give her a ride. Desperate to leave, Lucy agreed and rode with him for approximately an hour before he dropped her off under a tree and told her to wait for a guide. The Border Patrol arrived shortly after. Lucy was arrested and transferred to the T. Don Hutto detention center in early April 2015. Due to the trauma she suffered, Lucy struggled with memory loss and would lose her train of thought mid-sentence. It was very hard to carry a conversation. When she struggled to tell her deportation officers at Hutto what had happened to her they became frustrated and verbally abusive. In May 2015, Lucy attended American Gateways’ weekly “Know-Your-Rights” presentation. During the presentation our staff attorneys explained avenues for relief for women with experiences like Lucy’s and she came forward for assistance. Thanks to staff attorney, Clarissa Bejarano, Lucy was released from detention and her application for relief was approved in early March 2016. She is now working to overcome her trauma and has become a more cheerful, hopeful person. She is currently living in Austin and has enrolled in English classes. She hopes to learn the language, get a GED and enroll in college as soon as she can. Cecilia is nine (9) years old and a U.S. citizen. She has been diagnosed with Acute Myelogenous Leukemia (AML) and is currently undergoing treatment in San Antonio. As she goes through treatment Cecilia needs physical care and emotional support. Cecelia’s parents, Rogelio and Graciela are undocumented immigrants from Mexico. Because of their lack of immigration status, it was impossible for Cecilia’s parents to travel from the hospital to their home in Laredo because they would encounter Border Patrol checkpoints along the way and run the risk of deportation. Graciela, whom came to San Antonio via medical transport, was essentially stuck in place, while Rogelio was unable to come northward to be with his daughter. In the fall of 2015, American Gateways’ office in San Antonio began working with Cecilia’s family to request special permission for her parent’s to travel freely in the United States as they cared for their daughter. Just this week, 2016 the Department of Homeland Security approved our request for Graciela. Rogelio’s case remains pending, but we’re hoping for a resolution soon. Congratulations to our San Antonio team on their excellent work. Sarah is a trafficking survivor from Guatemala. In July 2013, she traveled to Canada on a work visa. She hoped to send money home to her children who were staying with their grandmother. Shortly after arriving in Canada, however, she learned that her brother had been murdered in Guatemala. Sarah immediately returned home to bury her brother with whom she was very close. This required her to permanently cancel her Canadian visa. Once in Guatemala, Sarah publicly sought out her brother’s killer through social media. One day, she received a Facebook message from a girl who claimed to be his wife. She arranged a time to meet with the girl, but was instead set up to meet with the men who killed her brother. The men gave her intimate details of her home in Canada and of her children and threatened her with death unless she left the country. Shortly after that incident, the same people shot at Sarah and her sister. Sarah was not injured, but her sister was shot several times. Terrified that her children were in peril, Sarah fled to the U.S. Upon crossing U.S./Mexico border, Sarah was abducted by members of a local cartel and taken to a house in McAllen, Texas. There, she was repeatedly and violently raped at all hours of the day and night and forced to cook, clean, and care for her captors. Other immigrant women were also being raped and held against their will in the same house. A young teenage boy carrying a loaded AK-47 was among the persons who held her against her will. He would angrily aim the gun at her and the other women and threaten them to do as they were told, specifically telling them not to resist being raped or they would be killed or buried alive as he had seen happen to other women before. Sarah thought her death was certain. After about three weeks, Sarah was bundled into a car and abandoned in the desert. Shortly after, she was encountered by U.S. Customs and Border Protection, who arrested, detained, and transferred her to the T. Don Hutto detention center in Taylor, Texas. It was there that American Gateways attorneys found her and began representing her as a survivor of human trafficking. She has since been released, and her visa was approved. 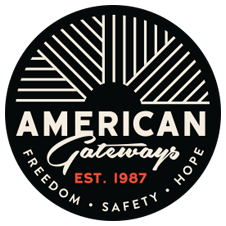 American Gateways attorenys are now working ro reunite Sarah’s children with their mother in the U.S.
Gladys was a business owner in Guatemala who began experiencing frequent extortions by drug traffickers. Eventually, the traffickers began to demand that she also sell drugs out of her shop. Gladys refused and threatened to report them to the police. The traffickers just laughed as they had already paid off the local police. Instead, Gladys decided to simply shut her business down. Furious with her defiance, the traffickers tracked her to her home and raped her, threatening much worse for her and her family if she did not do as they ordered. Gladys and her family moved over 300 miles away, but the threats kept coming. Feeling that she was endangering her family, Gladys saw no other option but to flee to the U.S.
Gladys traveled from Guatemala to the U.S. with a group of people who were led by different men along the way. After crossing into the United States from Reynosa, her guide handed her over to another group of men who took her to a house in McAllen, TX where they held her against her will for several days. One day, she was forced into a car with a man who sexually assaulted her, robbed her, and then put a gun to her head demanding more money as he sped through the streets. He laughed as he told her that she had no idea what awaited her where he was taking her. Believing that she would be sold, tortured or killed, she jumped out of the speeding car hoping to get away or to die. After her arrest, Gladys was detained at the T. Don Hutto Residential Center in Taylor, Texas. Through American Gateways’ weekly Know-Your-Rights workshop, Gladys secured pro bono representation. With the assistance of former American Gateways attorney Stephanie Taylor,she was able to report her experiences to law enforcement and apply for a trafficking visa, which was quickly granted. Since her release, Gladys has continued to work with American Gateways attorney Clarissa Bejarano to apply for derivative visas for her husband and children, which were approved as of January 25, 2016. Gladys is now legally living and working in Austin, continuing to heal from her injuries, and anxiously waiting for the day that she will be reunited with her family. Detained Asylum Seeker Wins Relief! Ms. P left her native Guatemala to escape severe gender-based violence. When she was a teenager, a police officer in her village forced her family give her to him as repayment for a loan. Over the course of the next ten years, he regularly assaulted her and threatened her with death. Ms. P was helpless to stop him because of his close relationship with the police and her village council. Finally, in early 2015, Ms. P was able to escape to the United States. Upon crossing the border from Mexico, she was apprehended by U.S. Customs and Border Protection and sent to the T. Don Hutto Residential Center, an immigrant detention facility, in Taylor, Texas. It was there that American Gateways attorneys found her during our weekly Know-Your-Rights presentation. Thanks to the tireless efforts of pro bono volunteer Julie Wimmer, Ms. P was granted relief by an Immigration Judge and released from detention in December 2015. She had since relocated to California and looks forward to starting a new life free of persecution. @COSAGOV set up a resource center across the street from the Greyhound station to help the many families arriving from the border book tickets to final destinations. Email tinogallegos@sanantonio.gov for more info.